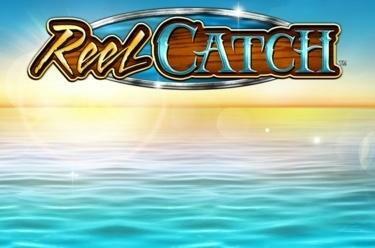 Play Reel Catch™ online for free now! With the slot Reel Catch™ you cast your fishing line on 5 reels with 40 win lines! 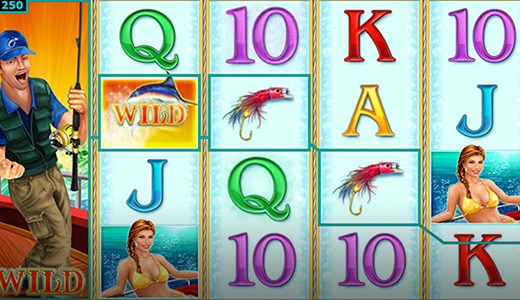 Angler and swordfish act as Wild symbols and improve your winning combos, the Scatter boat takes you to 20 free games. Start the reel engine now! Your aim in Reel Catch™ is to line up 5 matching winning symbols on one of the pay lines that all run in different patterns from left to right. Scatter symbols are exempt from this rule and win in any position. Angler and swordfish are Wild symbols in the game. They are the basis for the "Reel Slide™"-Feature which always appears when an angler lands on the first reel and one or several swordfishes land on the remaining reels. The boat is the Scatter in the game; when you land at least 3 boats you head for 20 free games. When an angler lands on the first reel and one or several swordfishes on the second, third, fourth or fifth reel the "Reel Slide™"-Feature is triggered. The angler expands until he covers all reel positions of the first reel, he is fixed for the remaining free games and afterwards pulls all reels in the gaming area that show a swordfish to the left. With Reel Catch™ you enjoy a beautiful summer's day at the lake! A sleek boat is at the ready and we also provide friendly company. If you have brought along a fishing rod nothing gets in the way of a perfect trip. And just between ourselves: This lake is brimming with Twists - all you have to do is catch them! And on top of that you can enjoy a great view! Can you already feel the warm sunshine on your skin? We are sure that you will reel in a big catch today!